Die indonesische Provinz Timor (zur großen Insel Timor gehören noch viele kleinere Inseln) ist eine Welt für sich mit unzähligen ganz verschiedenen Sprachen und kulturellen Hintergründen. Bei aller Exotik (Gamelangongs u.a. ) erklingt immer wieder seltsam Vertrautes: Bauern singen zu verstimmten Harfenklängen wie die schwarzen Baumwollpflücker in den Südstaaten. Ist der Blues so weit verbreitet? Eine weitere vielschichtige Produktion von Prof. Margaret J. Kartomi, (s. auch Flores, 13175-2) mit ausführlichem Beiheft. The island of Timor is the largest of the group of islands that make up the province of Nusa Tenggara Timur (NTT). The province, which also includes the islands of Sumba, Sabu (local pronunciation) or Sawu, Rai Jua, Roti, Ndao, Semau and Flores, with the islands of Komodo and Rincah to the west and Solor, Adonara, Lembata, Pantar and Ator to the east, divides into 12 administrative districts (kabupaten), which roughly correspond with the major ethnic divisions in the area. To the east is the new nation of Democratic Republic of Timor-Leste. The area has poor natural resources with a semiarid tropical climate, low rainfall and a long dry season, making it the most poverty–stricken of Indonesia's provinces. 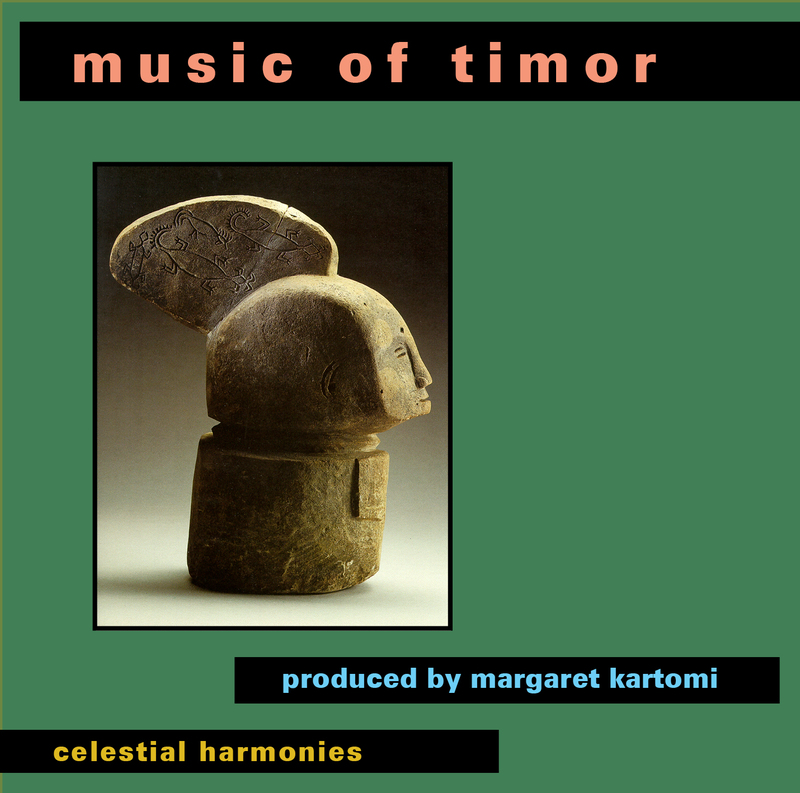 Though there are close music–cultural and ethnic links between the people on both sides of the border of East and West Timor, this recording contains only aural clips from the rich song and musical traditions of all four districts of West Timor. Tracks 1–6 were recorded in Kabupaten Kupang, tracks 7–9 in Kabupaten Timor Tengah Utara, tracks 10–19 in Kabpaten Belu and tracks 20–23 in Kabupaten Timor Tengah Selatan. The four districts differ from each other musically according to their different mixes of ethnic and historical experience, with the westernmost district having been the most thoroughly exposed to outside contact. Some of the items included on this recording are excerpts of long ritual ceremonies, especially pre– and post–battle ceremonies with gong and drum ensemble music or mass choral music with circle dancing (tebe), attended by many Timorese wearing traditional ikat (woven cloth) costumes. There are some selections from the large repertoire of vocal or story–singing music, for example, long poetic songs telling of prehistoric migrations of people. Examples of the variety of flute, jews harp, guitar, violin and sasando–biola music for informal occasions found in each district are included.